When I think about it we had a great time making this fanzine, so much so we’ll probably do this again! What’s more you can even find out what inspired us at the time by following our comments, in volume 3 Galou was listening to the pop-tastic “noumanoumayé" while I was addicted to brother dear brother (Oniisama)! 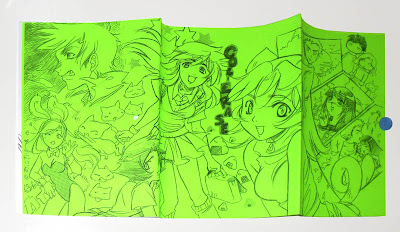 The covers for the first Col-Erase was printed on florescent A3 paper, in a selection of eye watering colours and folded up neatly like a wallet! After our first volume all other following Col-Erase books had a double cover, our fanzine was reversible as the first half was printed in one direction, and the second in another. 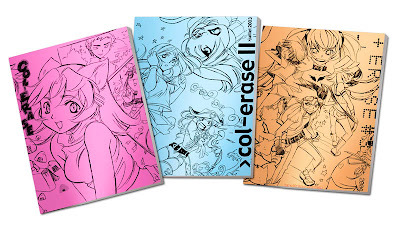 Just to let you know, we still have a few copies of Col-Erase 1 and 3 left and we’ll be selling them at Harajuku!